Front Tires Maxxis Bighorn 2.0 27 x 9 x 12 in. Rear Tires Maxxis Bighorn 2.0 27 x 11 x 12 in. 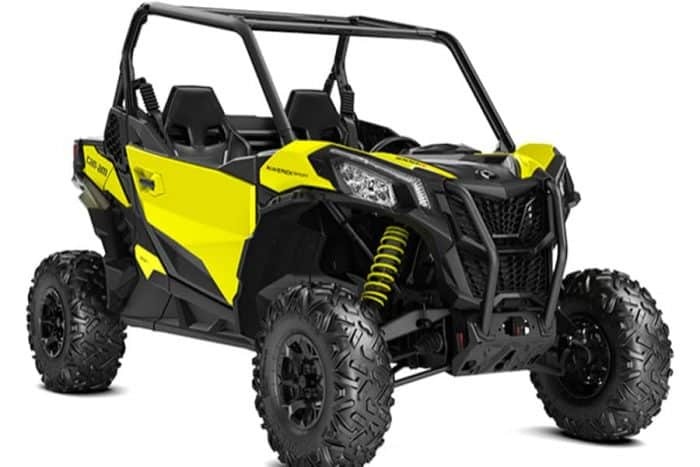 CanAm has engineered the Maverick Sport to use every last bit of width – this 60-inch side-by-side excels in handling, stability, and poise. Thanks to its long wheelbase and sport-tuned suspension, the Maverick Sport delivers thrills and stability. At 100 HP, the torquey, responsive Maverick Sport definitely won’t leave you waiting. Battle-tested Rotax V-twin technology has been around the block, around the track and around the world. Our Dynamic Power Steering (DPS) is tuned for narrow, high-speed trails where control is key. And here’s the secret of Dynamic: At low speed, assistance is increased, while at higher speeds, assistance is reduced. Can-Am engineers had one goal when calibrating the Maverick Sport: to make a side-by-side that thrills. Across a 90.6-inch wheelbase, on 12-inch cast-aluminum wheels, and 27-inch Maxxis Bighorn 2.0 tires, it’s the 60-inch that delivers fun on the trail. The Maverick Sport is equiped with double A-arms front suspension with sway bar and TTA rear suspension with sway bar to support the FOX 2.0 PODIUM shocks that give you 11.5 inches of travel in the front and 12 inches in the back. From its lightweight steel cage to its integrated front steel bumper and injected full skid plates, the Maverick Sport is a responsive suit of armor for those riding off in pursuit of adventure.